This Ramadan'ing spirit has faded already. I became a recluse all day. And I found little solace in the comforting words of others. I don't think I make a very good 'Saima' (arabic for 'fasting woman'). Suhoor and fajr was complete by 4am; water was the key to staying alive. That and cereal. I think it's unnecessary for people to spend the previous evening cooking for a ten minute breakfast. I muttered against the daily news reports of obesity levels this, presidential speeches there, and political party's corruption that, and took to praying and dhikr. Alone. Where is the community? Ah! Subhan'Allah. I bear witness that there is no more refreshing and sweeter taste than that produced from salat. It cools the mind down, sets disorder back into balance and reassures our minds 'chill, there are greater trials ahead, you can do this, remember Allah for creating you out of clay and giving you this simple but complicated life'. I change my tune then don't I? - Alhamdulillah for every moment spent in the remembrance of Allah. Well, I attempt to change it for a while. 1) Curse less - I have a colourful language that I know for sure isn't halal for the tongue. 2) More anger management - things just make me mad. Not trivial things, but universal, anti-humanity, environmental and prejudiced things. 3) More patience with Allah's masterplans - I see that Allah tests me more when I'm weaker and I know He is. Instead of rising up to and passing those challenges the "I can't change things" attitude comes forward and giving in becomes easier. 4) Show more compassion towards people, especially the evil neighbours - we get along well but the married couple down the driveway have it in for me. I know this because they accused me of driving 'too much' down our shared driveway, 'spoiling the aesthetic' by cutting the trees in my own garden and other pathetic rants. For the love of - ! I shall now on not ignore them or ask Allah to kill their cat. 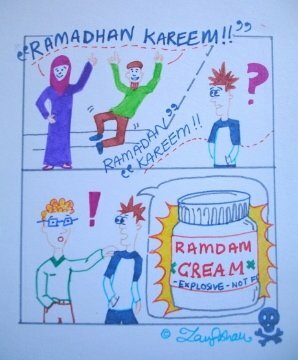 In fact, I'm making ramadan cards that I'm certain they'll appreciate that. Insha'Allah. Later at 1:20pm before dhuhr salah I hear a message that my aunt's converted to Islam, alhamdulillah! I pause and wait for the 'but'... She has converted to Islam but it may be just for the month of ramadan, to 'test the holy waters' so to speak. Converts to Islam just do not receive the full welcome package the Prophet (saw) would encourage. 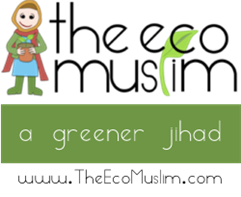 Where is our active compassion towards supporting newbie Muslims who are leaving their whole lifestyle to believers? Where?! Insha'Allah this recent conversion will be a permanent move, I tell everyone. ...only the sewing machine commits suicide on me. I blame the Industrial Revolution for mass producing obsolete and weak plastic products that die before they are unwrapped. Simultaneously I use a spare index finger to multi task on the computers to redraft a 'jihad' essay, begin and complete a MUSLIMNESS cartoon, sketch out card designs and brief others on fundraising ideas. I sulk as not many people message me, ask me how I'm doing or how my fasting is going. They send commands my way for work. Plus they've all taken a 'Fast from Socialising' so the only way to see them is by ticket entry to the underground masjid where they are all sat on lit-up rocks in thobes, making chants like their life depended on it. Friends are so useless. By 4-5pm the work's not all done but I'm neglecting my Qur'an reading now. It was no big deal I suppose. Not really. It came to 11:30pm as I slumped in a couch making silent tasbih with a headache and listened to women talk about how people can abuse the Ramadan Reward System. Do not forget the 'tarawih' salah! 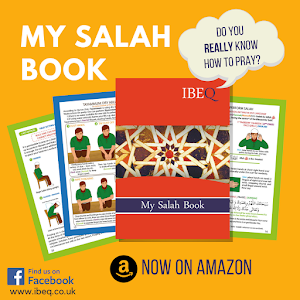 one woman said, 'they are intensely rewarding and should be read' - I wanted to jut in about how Muslims neglected the 'fardh' prayers anyway (eleventh complaint). ...But I knew that was disrespectful so hushed my mind. Another woman said she wasn't praying at all but kept the fasts so far. In my head I'm so anti-social it sickens me. Arriving at home I threw everything on the floor. There's a trail of car keys, food parcels, headscarf, little children and shoes from the main door to the study room where I'm sat. It's 2:07am in England, UK. I still have some designing to do. I'm writing a book too on behalf of someone important which is always in the 'things to do before I die' list. I should clone myself. Why haven't scientists invented that successfully yet? I read a recent article on 'synthetic engineering' becoming more of a reality. Stupid playing-god-wannabe's. So, the fast began cloudy and the storm's still thundering. I found 3 seconds of funny time in someone's message 'Ramadan Cream to you!' (instead of the usual 'Kareem'). I know, I complained. A lot. Like I said, not a good, constructive, positive fast. Maybe insha'Allah tomorrow I'll see the light and find inner peace, sakoon, contentment and balance. So ends Day 2 of Ramadan'ing.